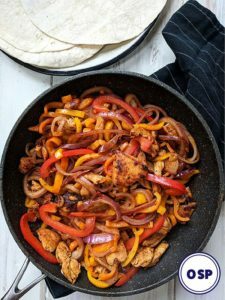 This simple, tasty one pot Chipotle Chicken Casserole is zero SmartPoints on Weight Watchers Freestyle / Flex plan. 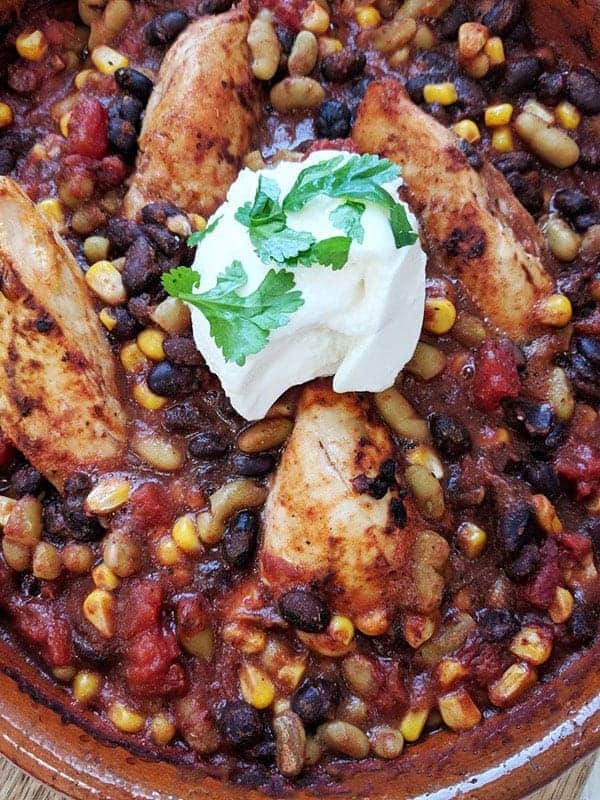 Full of healthy and filling beans, it makes a perfect Weight Watchers meal. It is easy to freeze and takes minutes to reheat in the microwave for those days you just want to eat not cook! 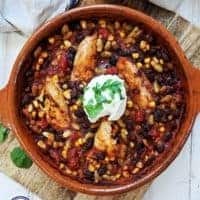 One of my favourite things about this Chipotle Chicken Casserole (apart from it being zero Smart Points, tasty, filling and easy to make) is that it is perfect for batch cooking. 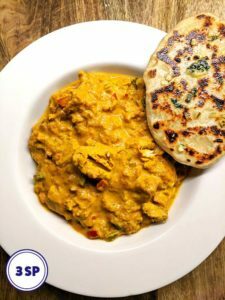 Cook up double the amount (using the very useful recipe multiplier in the recipe card below) and freeze individual portions for an easy meal that only take minutes to heat up in the microwave! I used 1/2 tablespoon of Chipotle paste in this recipe, but if you like your food spicy then you can up this amount to 1 tablespoon! 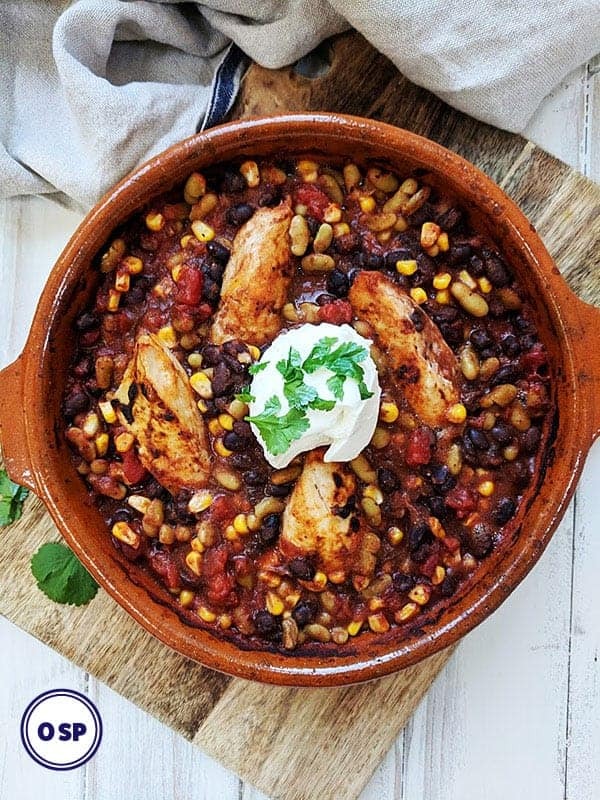 I serve this Chipotle Chicken Casserole with a tablespoon of 0% fat Greek yogurt. It works really well with the smokey Chipotle flavour! The ‘tang’ of Greek yogurt is minimal and almost feels like you are eating this casserole with a big dollop of sour cream! 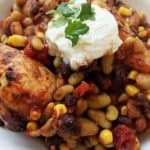 Looking for chicken recipes? You may like these! 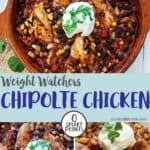 This easy Chipotle Chicken Casserole is zero SmartPoints on Weight Watchers Freestyle / Flex plan. 1/2 tbsp chipotle paste more if you like spicy! Place the chicken breasts in the bottom of a large, deep casserole dish. Top with the drained and rinsed beans, tomatoes, corn, chipotle paste, ground cumin and Cajun seasoning. Stir to combine. Cover the casserole with kitchen foil (or casserole lid if you have one). Bake in the oven for 20 minutes. After 20 minutes, remove from the oven and remove the kitchen foil / casserole lid. Stir and place back in the oven, uncovered for a further 15 - 20 minutes or until the chicken is cooked through. Top with a tablespoon of 0% Fat Free Greek yogurt. Made this for the family and served with white corn tortillas (2 SPs per tortilla) and toppings of 0% Greek yogurt, diced white onion, cheese for the kids, a couple of slices of avocado and a squeeze of lime. They were well received. I thought they felt like there was a little something missing – a base of sweated onion maybe? But given how easy it was and flavourful despite having no fat or sugar, I will definitely do it again. It’s a good way of making boring chicken breast tender and tasty. Thanks! My meal came out really watery and chicken wasn’t crisp like picture. Was good tasting.